Historically, women in labor are supported by a circle of caring women. Research shows that Doula support greatly improves birth outcomes. As your doula I can offer assistance with birth planning and support through your entire labor. 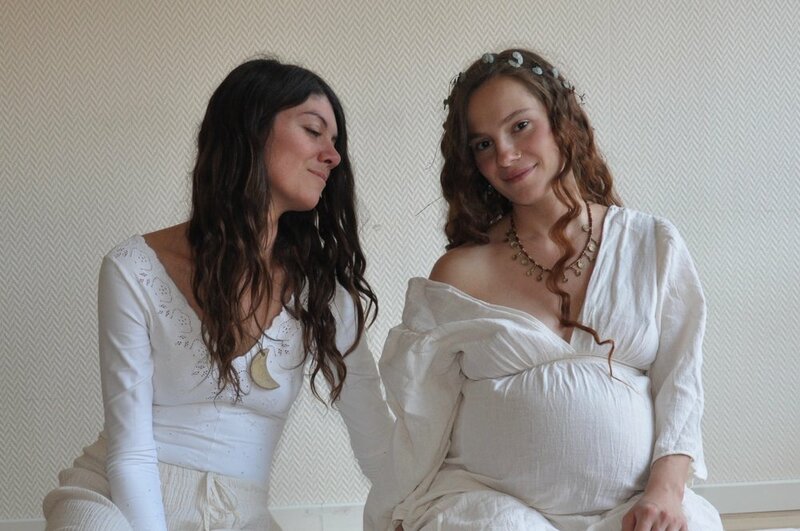 Including massage, movement, ritual and other natural comfort measures, helping you and your partner have an empowered birth, honoring the sacred nature of your experience. For expecting mothers, this nurturing massage combines gentle stretching, fluid movement, and attentive pressure to release the hips, relax the pelvis and prepares the mind and body for labor. After baby's birth most traditional cultures have sacred rituals to heal and rejuvenate mother's body and soul, a support for her transition into motherhood. Studying with traditional women's healers in Thailand and Bali inspired me beyond words to share this level of care. Warm Herbal Abdominal work helps integrate the birth experience, relaxes afterpains, restores muscle tone, supports the closure of diastasis recti. The ayruvedic system teaches that the element of Fire maintains pregnancy, Wind comes to bring the birth, but too much wind can create restlessness and anxiety. Bundles of steamed herbs replace warmth into the abdomen, reliving anxiety and a sense of emptiness that can linger in the belly after birth. Herbal Breast massage supports successful breast feeding, balancing milk supply, easing engorgement and helping to prevent and clear mastitis. Culturally adapting traditional Thai and Balinese techniques, I use local aromatic herbs known to have beneficial postnatal properties, mindfully wild-harvested.